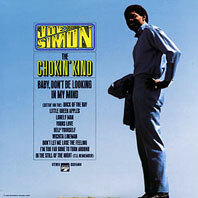 Joe Simon is an American soul singer. In 1969 Joe Simon finally had his long overdue breakthrough hit. "The Chokin' Kind" (written by country songwriter Harlan Howard and first recorded by Waylon Jennings in 1967) gave him his first R&B #1. It also reached #13 on the pop chart. An album of the same name (his second that year) quickly followed, a great collection of songs showcasing his smooth country-soul sound. It featured covers of some recent hit songs, namely Glenn Campbell's "Wichita Lineman", O.C. Smith's "Little Green Apples" and Otis Redding's "Sitting On The Dock Of The Bay", plus a look back to the doo-wop era with "In The Still Of The Night", originally by The Five Satins. The album generated two more hits, both of them again written by Harlan Howard - "Baby, Don't Be Looking In My Mind" followed "The Chokin' Kind" and charted at #16 R&B, and "Yours Love" would belatedly chart at #10 R&B in 1970.